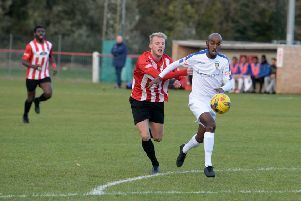 Crawley Green produced a stunning display to hit back from 5-1 down with 20 minutes to play and draw 5-5 at Cockfosters on Saturday. True to recent form Crawley conceded after only three minutes when George Beattie broke down the left unchallenged to fire past Dean Bull to make it 1-0. Green looked to respond immediately when Danny Watson set up Billy Lobjoit but his strike was well saved by Adam Seymour. Bull made a fine stop from Ryan Wade’s free kick, as Crawley drew level after 18 minutes, when good work by Tyler Ingham set up Lobjoit whose cross was converted by Watson. 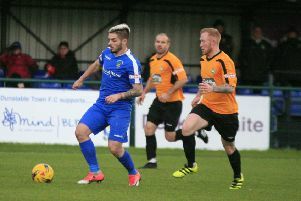 The visitors were only level for six minutes before they conceded again as Steven Redmond gave away a free kick on the edge of the box and Ryan Wade smashed the ball home. Wade followed with two more efforts which were saved by Bull, while Crawley should have drawn level just before the break but Watson missed from close range. A terrible start to the second period saw Green ship three goals in 17 minutes. First they conceded another needless free kick on the left and Wade again beat Bull to make it 3-1. A fourth followed five minutes later as Wade completed his hat-trick, netting from the rebound after Bull parried a fierce attempt. The visitors came close to reducing the arrears when Watson went past the keeper but Lobjoit just failed to connect with his cross. It looked game over on the hour mark as Beattie was put though to find the net as his side led 5-1. Bull kept out an effort from Jack Francis and Beattie shot wide as Green introduced Aaron Morgan and Jake Alderson. They got one back on 71 minutes, when Adam Mead collected the ball on the edge of the box and drilled his shot past Seymour. That was the signal for the game to change, as two minutes later, Watson was put through and he rounded Seymour to make it 5-3. Crawley poured forward seeing efforts from Mead and Lobjoit blocked before they scored again in the 81st minute when a corner from the left was headed home by Sam Pemberton. Bull saved a shot from Reece Mosanya to keep Crawley in the hunt and in the 89th minute they drew level. Alderson and Watson combined well down the right and the cross was turn in by Phil Draycott to make it 5-5. In added time Crawley’s Sam McClelland did well to block a shot and the rebound seemed destined for the top corner but fortunately for Crawley, it went just over as they salvaged a point that had looked extremely unlikely. On Saturday, Crawley entertain Baldock.